Some good news for iLOFAR - the planned Irish contribution to LOFAR appeared in the Irishtimes.com today. Click here to download the i-LOFAR brochure. DERMOT DESMOND has pledged financial backing for plans to build a powerful new telescope that will allow scientists to eavesdrop on objects in space. Mr Desmond met a group of Irish scientists last Friday to discuss the building of a state-of-the-art radio telescope at Birr Castle, Co Offaly. He agreed to provide some funding for the development of the project. The telescope, costing €1.2 million, would be the biggest investment in Irish astronomical equipment since the building of the Great Leviathan Telescope by William Parsons, the third Earl of Rosse, at Birr in the 1840s. It ranked as the largest telescope in the world for more than 70 years. “We still have a ways to go to get to €1.2 million to purchase and install the station, but is a step in the right direction,” said Prof Peter Gallagher of Trinity College Dublin, who is a member of the consortium behind the plans. The telescope would consist of a number of antennae to detect low frequency radio waves such as those emitted by ancient astronomical objects formed shortly after the Big Bang. Up to 50 radio telescopes of this type already exist – in the Netherlands, Germany, France, Sweden, and the UK. These facilities have been linked together in a network called the Low Frequency Array (LOFAR), which join to form an even more powerful telescope. 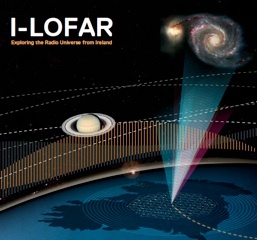 Increasing the overall size of the network by building a station in Ireland would enable LOFAR to image distant objects in much finer detail. The Irish station would be called I-LOFAR, and would be connected to the central processing centre in the Netherlands using a high speed fibre optic network. This connection would be 100 times faster than broadband speeds in Ireland, said Prof Gallagher. Birr Castle was an ideal location for a new station, he said. Ireland is extremely radio-quiet compared with other European countries. In rural areas such as Birr, the very faint radio signals coming from objects from the early universe would be detectable, as there is very little interference here. The estimated cost of the project for the first five years is €3 million. This would include the expansion of the Science Centre in Birr. Fáilte Ireland has expressed support for the plan, which could increase the appeal of Birr Castle and the area for tourists. “There is the potential for at least one Nobel Prize in this project,” Prof Gallagher said.